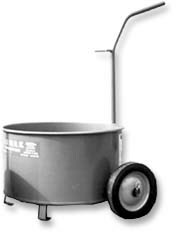 13 GALLON STEEL MOP CART WITH RUBBER WHEELS (FOR HOT ASPHALT). 20 GALLON HOT ASPHALT MOP CART WITH 10 INCH WHEELS. 24 GAUGE ALL STEEL CART WITH ROLLED TOP EDGE.